A large Humpback whale bubble net feeding with its mouth wide open, sea gulls joining the party, photographed in Broughton Archipelago in British Columbia, Canada. After photographing whales for so many year it is difficult to get myself excited about new shots. Don't get me wrong, I'm happy about every shot wildlife allows me to get. I also have many favourites in my archive which I'm more than happy with but once a while I get new shots which are making me extremely happy and this one is one of those. While bubble net is very common in Alaska waters, one can't see it here too often. While the humpback whales do bubble net feed off the Vancouver Island coast it is very difficult to photograph it as you don't get many indication where they come up. it seems like that they feed shallower here and mostly after a deep dive. That means you only get seconds to find the bubble and be ready. 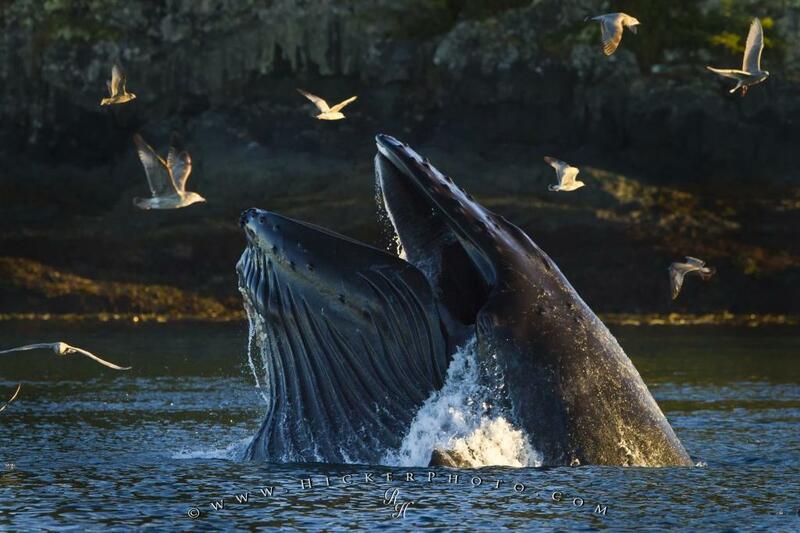 Photo of a humpback whale bubble net feeding while sea gulls having a feast too, British Columbia. This moment of a humpback whale bubble net feeding with lots of western sea gulls around is for myself a shot I was trying to get for many years. Hope you like too. I photographed this photo with the digital SLR camera model Canon EOS 7D, aperture of f/4.5, exposure time of 1/2000 sec. on ISO 400, as always I used a original Canon Lens, the focus lenght for this picture was 300mm.